This is Eric's Combat P51 Mustang featured in a highly doctored photo (the plane was hanging on his bedroom wall at when the photo was taken). Eric with his plane just after one of it's many repairs. We had an old Fox .15 on the plane. This is enough to pull the plane through the air at very high speed (we don't know how high, but in a dive we know it is over 100mph). 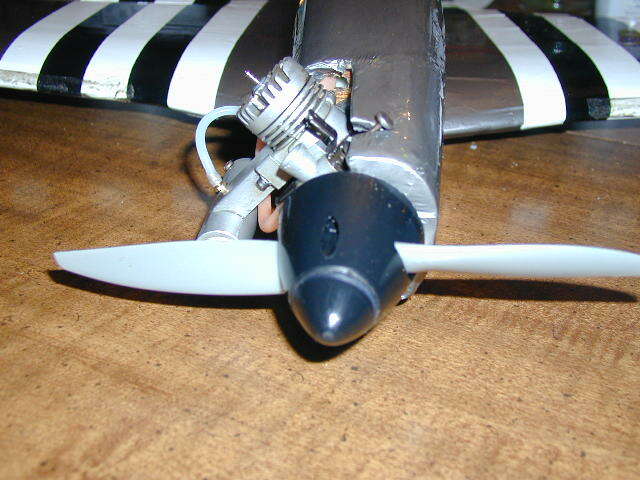 Eric put an OS .25 on it and flew it even faster a few times before striping the electronics out for another plane. This plane has crashed many times. Eric bought is used, and it was already used to crashing. Then I set the CG wrong (3 times). And once Eric just lost his orientation on landing. It is really amazing what can be done with a Dremel tool and super glue! These repair photos were taken a few days before the photos above. It has been flown several times since then. 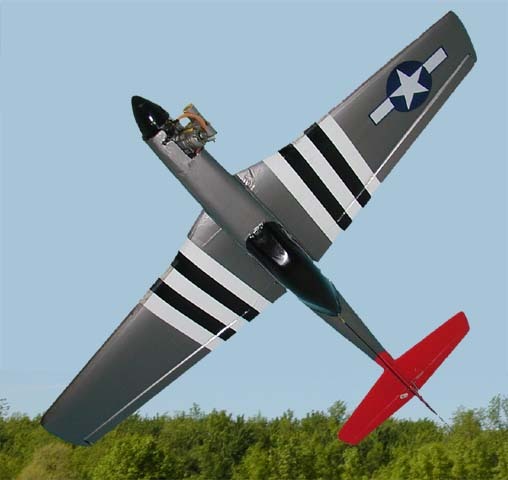 About combat: This class of plane has to be a WWII replica (within 10% of scale), weigh no more than 3lbs, and have a motor no larger than .25ci. They pull 30 foot streamers and up to 6 of them chase each other around the sky for 7 minutes trying to cut the other guys' streamer with the prop or the wing. 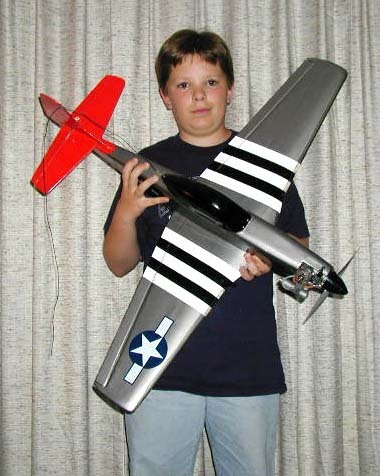 Eric had a 4 ounce tank in this plane, but that only gave him 6.5 minutes of flight. About 10 minutes is recommended for 7 minute combat. He now carries 8 ounces. These planes land on their bellies. If wheels were included they would have to be scale, and they would be too small. 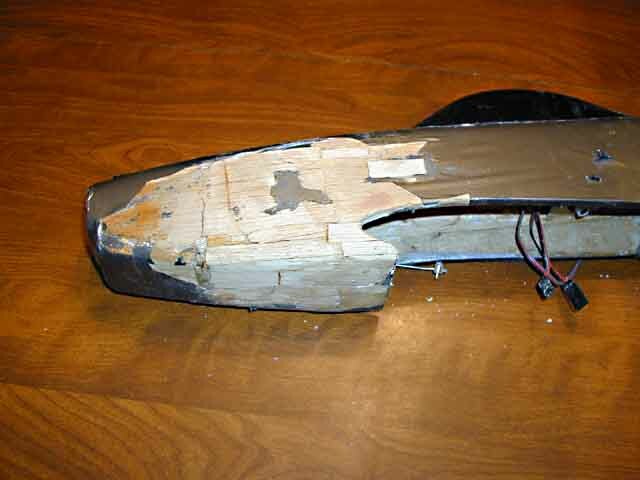 This is a 3-channel plane; aileron, elevator, and throttle. The control surfaces don't move much. The ailerons move about 1/8 inch in either direction. This is plenty. The elevator doesn't move much either. If just a little too much elevator is put in, the plane snaps into a roll. Just the way the full sized P51 did, I'm told. Eric hasn't flown this in combat yet, but the previous owner did.